Each team member that I have cooresponded with has been very helpful not only with the diffrent cabins that you have available but also with the local attractions. Our mini vacation was a sucess and we are hoping to make the Winter Mini Vacation a family tradition. We were pleased to find a Christmas Tree set up in the cabin and it gave us inspiration to do a mini gift exchange. We may have not been able to see the snow fall this time but the weather was perfect to use the fireplace and to be able to fully enjoy the beautiful cabin. This trip was booked with the intention of experiencing the weather change and with the hopes of seeing snow. Even though we did not get to see the snow fall we were able to see the ice, icicles and snow in the park. It was amazing!! Excellent customer service from the time I made the reservation to when we checked in. It was very nice and comforting to receive a call at the cabin to see if we'd made it in and if there were any issues that needed to be addressed. Cathy made this this and it was appreciated. Wonderful get away, excellent accommodations with great views - all that you could ask for. Everyone was very knowledgable and quick to respond. Very helpful. We had a lovely time! Very specific directions were given to the mountain home, and everything was just lovely. We came for The Polar Express. Everyone was very knowledgeable and quick to respond. Very helpful. We had a lovely time! Very specific directions were given to the mountain home, and everything was just lovely. We came for the Polar Express. Melissa and Kelli were awesome! I may have spoke to another girl, but I'm sorry I can't remember her name. None the less, all of them were so nice, very responsive, and walked me through all the details, surrounding area, and of course, the cabin rental. We had never rented a cabin or been to the NC mountains so we were apprehensive...everyone took care of us and everything they told us was exactly what we experienced-Thank You! We will definitely be back! What an amazing time for me and my family. The primary reason for the trip was to ride The Polar Express in the mountains for our 3-year old 'trainiac' to have the ultimate experience (which was awesome, by the way), but the entire trip, cabin, mountains, hospitality became an amazing "Experience"--something we will treasure! Our son, and only child, saw snow for the first time at the tubing hill, rode The Polar Express, hiked around the cabin, played pool, and spent quality time with his grandparents and parents....all of it was amazing! We love it all...I think the best was the overall attention to detail...everything was placed just right, the decorating was so tasteful and homey...all of it was warm, inviting and felt like our home! This is our second trip here this month. I loved it so much I came back the very next weekend with other friends and stayed even longer. The cabin is so clean and well taken care of. It is good to know that this little escape is here. I will be back as often as possible. We had a wonderful weekend here with our grandkids. We enjoyed the polar express on Friday night. Shopping on Saturday. Everything was great. We came to town to ride the Polar Express. 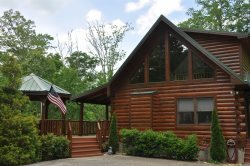 Your cabin was the perfect setting for our holiday getaway. We Thoroughly enjoyed ourselves for our birthday/anniversary weekend. I worked w/ 3 different ladies in the office. All were wonderful. They were very concerned about my needs of finding the perfect cabin. Each one of the ladies, Kathy, Melissa & Kelly, were telling me some main attractions of the town & outlining areas, as well as described to me the setting & location of the cabin we rented. They really cared. Our stay was fantastic. We only stayed for a weekend. The next time we arrive we hope to stay for a week. The view above Bryson City was beautiful, day & night. The sound of the river below us was so relaxing. A very quiet, off the beaten path, cabin but so close to the places we wanted to visit while in town. I have worked in customer service for over 25 years, the customer service that these ladies provided here at GSCR as well as the Maintence man Mike was outstanding I spoke to other companies in the area and I felt like I was just a number with them were here I was important. Also it is very important to me that if this is owned by a local person and not hotel chain, that we keep the money in the town, County, state. I do not want to send Americas profit off to another country. Our hot tub went to sleep mode. I did not know what was wrong after reading the folder that was left behind on everything that we need to know about the cabin. I called and Mike the maintenance man came out very promptly. all it was was just a little bit low on water. He went on to tell us about the town of Judson that was buried under Fontana lake very very knowledgeable and a super nice guy thank you so much!!! Nothing needed for this trip everything was perfect thank you so much. Polar express, hiking in the Great Smokey Nat. park. Looking for Elk. Visiting Fontana dam, going over to Cherokee for their winter carnival but we ran out of time so much to do and just a few miles out of town. Our Mini vacation was amazing thanks you your beautiful home. WE mostly relaxed at the cabin but our main reason for coming was the polar express. Which was magical for us all. We will return next year and stay in the exact place. Thank you so much. My Husband and I came here for our honeymoon! We loved the Cabin and the stay. The view was amazing! We are so looking forward to coming back again and again. Your team were so friendly to us, and gave us excellent advice and directions. This made our trip so much easier, especially with reminders about the waterfall map, the lockbox code, and key to the cabin. Great cabin. Comfortable and cozy. Authentic mountain cabin with the extra touch in amenities. Our trip was planned around the "The Polar Express" in Bryson City, NC. Cathie mentioned to me over the phone that Wolf Ridge would be perfect for our stay. Her enthusiasm and courtesy won me immediately. We loved the Filing Station, The Iron Skillet, and Waynesville's local "Clyde's Diner". I asked my 5 year old grandson, Isaac, what his favorite feature of the property was. He answered "Everything". I especially liked the view, how up high up, and placement of the cabin on the mountain. The beds were especially comfortable\, and the living room furniture. Loved the bathrooms too. It was very good and we plan to come back for the quiet and how nice everything was. They were great. When I called then to tell them we arrived early and were needing to check in they were very courteous and helpful. This was one of the most relaxing and most beautiful places I've ever stayed. The relaxing hot tub outside to the toasty, romantic fireplace inside. They had everything set up for us. I would like to have stayed longer. It's as if time stopped and was very surreal and relaxing. I will most definitely be coming back every chance I get. Just absolutely loved this cabin. I love Cherokee & the mountains. I go to Harrahs Cherokee a lot. When I found this cabin it was the icing on the cake, I will never stay anywhere else again, ie: a hotel.